The topic of rethinking ideas of audiences and users inspired Jaime Renman and Larissa Gaul, a collaborating pair of winning artists in Technical Communication’s August 2018 cover competition. Jaime Renman is a senior undergraduate student pursuing a Bachelor of Arts degree in Public Policy with minors in Biology, Public Health, and Spanish at the University of Delaware. Her interest in health policy and community health began on a volunteer spring-break service trip to Baltimore focusing on urban hunger. She then had the opportunity to study abroad in Panama, where she learned about the inequalities affecting indigenous and destitute Panamanians. She is currently the President of the Food Recovery Network chapter at University of Delaware and Programming Senator for the Student Government Association. She has also worked in the Honors Program Housing as a Resident Assistant. Her involvement in the Blue Hens Leadership Program has been a way to cultivate her passion for engaging diverse communities in community leadership with a local nonprofit. Jaime has held internships with the City of Philadelphia and the University of Delaware Institute for Public Administration. She aspires to pursue a career in the public health field and write policy for government agencies. In her free time, Jaime enjoys swing dancing and playing ukulele. Larissa Gaul is pursuing a Bachelor’s degree in Environmental Engineering with a Water Quality and Resources concentration. Her interest in water resources came from spending summers near Lake Ontario. Larissa is also pursuing a minor in Energy and Environmental Policy to gain experience with different aspects of environmental issues. After undergraduate studies, Larissa plans to attend graduate school to continue studying water issues. Her extracurricular activities include club swimming, Engineers Without Borders, and research on topics like food waste digesters and biofuels. Larissa is occupied this summer in an environmental health and safety internship at an aerospace and defense company. Jaime and Larissa were both enrolled in a technical writing class taught by Dr. Jessica Edwards at the University of Delaware. They learned about Technical Communication’s cover competition through a course assignment to create a full proposal for the August cover. After looking at past successful covers, we knew it might be difficult to create a visually pleasing cover without design or art experience. We decided to use Paint.NET because it is user-friendly. We kept our design simple by using words instead of images. We tested various arrangements and backgrounds to create a more visually engaging piece. We also spent a lot of time choosing words that were meaningful, but did not portray minority groups in a stereotypical or insensitive way. We created a comprehensive list of words to represent a realistic audience before selecting the best choices from the list. Technical communicators often consider audience first when planning a piece of technical writing. The focus of our cover was inspired by this concept. Audiences come from different educational and cultural backgrounds, and have many different opinions, goals, and experiences. To connect with their audience, a technical writer must ask, “What are the audience’s goals? What are their cultural preferences?” and other questions. Our words can answer these questions. Dr. Edwards offered advice and guidance throughout our editing process. She provided feedback on word selection and aesthetics. The rest of our class also provided feedback during the project’s final presentation phase. We worked on this project for several hours each week for a few weeks. We used STC’s website, our textbook, and other websites for research. We created the graphic in Paint.NET and used the Gaussian Blur tool to blur the words. The glasses shape came from a free clip art website. 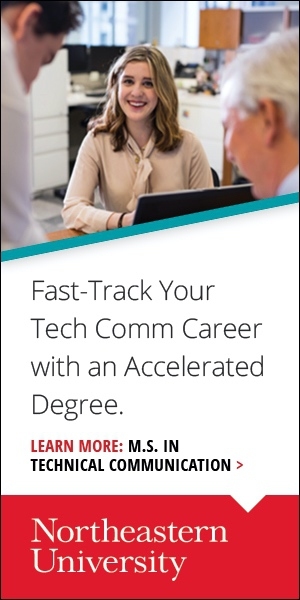 To view the August 2018 issue, please visit www.stc.org/techcomm. And, as a reminder, the deadline for upcoming submissions to the cover competition is 1 December. For the February 2019 issue (a special issue on content strategy), we invite cover illustrations on the subject of the theory, teaching, and practice of content strategy. For the May 2019 issue, we invite cover illustrations on the subject of finding your footing in the world of developer docs. For either issue, please submit your cover illustration (approximately 20×20 cm or 8×8 inches) as a high-resolution (300 dpi or better) jpg file by 1 December 2018 to tceditor@stc.org with a brief explanation (100-200 words) of how your illustration addresses the cover subject. A five-member international jury of specialists will organize anonymous review of the submissions and choose each issue’s cover illustration. Honorable mentions will be published inside the journal.